Brother P-Touch Tape 24mm Red on White TZE252 Pack of 1 A laminate film on the tape protects text and colours from all kinds of agents such as chemicals and abrasives commonly found in industrial environments. Tape is waterproof and extremely temperature resistant. 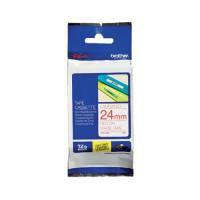 P-touch tape TZE252 24mmx8m. Red on White. 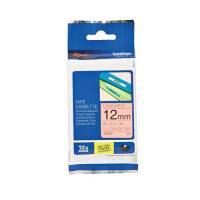 Brother P-Touch Tape 24mm Black on Blue TZE551 Pack of 1 A laminate film on the tape protects text and colours from all kinds of agents such as chemicals and abrasives commonly found in industrial environments. Tape is waterproof and extremely temperature resistant. 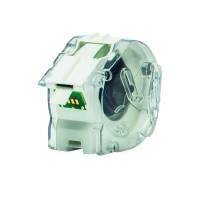 P-touch tape TZE551 24mmx8m. Black on Blue. Brother P-Touch Tape 12mm Black on Orange TZEB31 Pack of 1 A laminate film on the tape protects text and colours from all kinds of agents such as chemicals and abrasives commonly found in industrial environments. 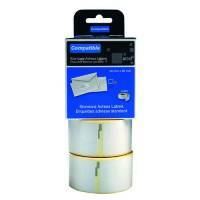 Tape is waterproof and extremely temperature resistant. P-touch tape TZEB31 12mmx8m. Black on Orange. 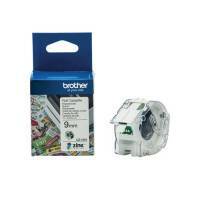 Brother P-Touch Tape 24mm Black on Green TZE751 Pack of 1 A laminate film on the tape protects text and colours from all kinds of agents such as chemicals and abrasives commonly found in industrial environments. Tape is waterproof and extremely temperature resistant. 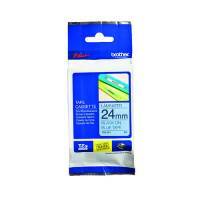 P-touch tape TZE751 24mmx8m. Black on Green. 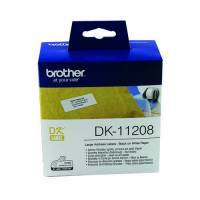 Brother P-Touch Tape 24mm Black on Yellow TZES651 Pack of 1 Laminate film on the tape protects text and colours from all kinds of agents such as chemicals and abrasives commonly found in industrial environments. Tape is waterproof and extremely temperature resistant. 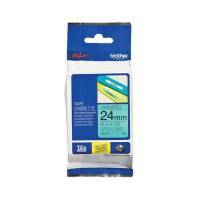 P-touch tape TZES251 24mmx8m. Black on Yellow. 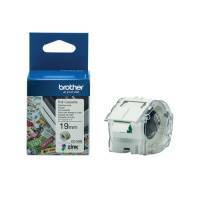 Brother Black on White Continuous Length Film Tape 62mm DK22212 Pack of 1 Replacement label roll for Brother QL series labelmakers. 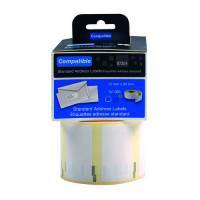 Continuous tape for any length of label with white backing. 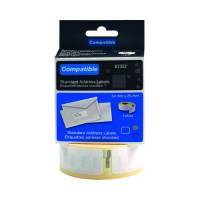 Self-adhesive backing for easy attachment. Width: 62mm. Supplied on 15.24m roll. Glossy film finish. Colour: White. 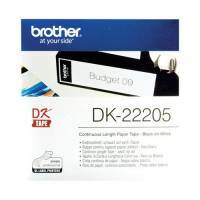 Brother Black on White Continuous Length Paper Tape 62mm DK22205 Pack of 1 For use with the Brother P-Touch QL500/QL550ZU. 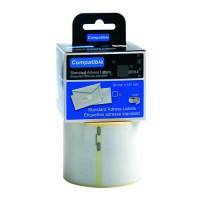 Continuous tape for any length of label. Allows you to select specific label size using printer software. Crisp white labels produce a clean professional print. Width: 62mm. Supplied on 30.48m roll. White. 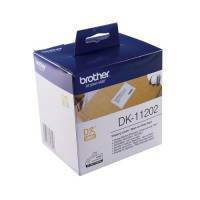 Brother Black on White Paper Shipping Labels (Pack of 300) DK11202 Pack of 1 Suitable for Brother QL-500/QL-550ZU printers. Standard size: 62 x 100mm. Adds a professional look to your envelope. Crisp white labels produce a clean professional print. 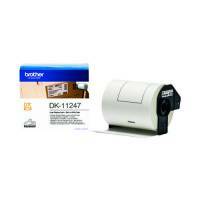 Easy to use and load into the compatible Brother label maker. 300 labels per roll. 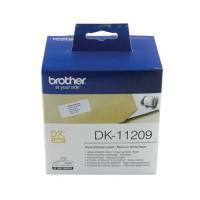 Brother Black on White Paper Small Address Labels (Pack of 800) DK11209 Pack of 1 Suitable for Brother QL-500/QL-550ZU printers. Small size 29 x 62mm. Adds a professional look to your envelope. Crisp white labels produce a good clean professional print. 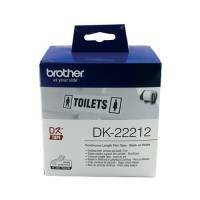 Easy to use and load into the compatible Brother label maker. 800 labels per roll. 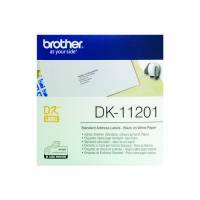 Brother Black on White Paper Large Address Labels (Pack of 400) DK11208 Pack of 1 Suitable for Brother QL-500/QL-550ZU printers. Large size 38 x 90mm. Adds a professional look to your envelope. Crisp white labels produce a good clean professional print. 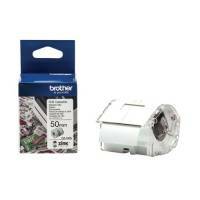 Easy to use and load into the compatible Brother label maker. 400 labels per roll. 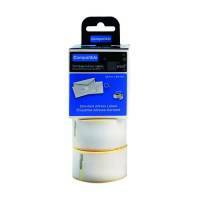 Brother Black on White Paper Standard Address Labels (Pack of 400) DK11201 Pack of 1 Suitable for Brother QL-500/QL-550ZU printers. Standard 29 x 90mm size. Adds a professional look to your envelope. Crisp white labels produce a clean professional print. Easy to use and load into the compatible Brother label maker. 400 labels per roll.